Many said it couldn’t be done in seven months, but VSD proved otherwise. There was a United States military sale of 15 new 35-meter patrol boats to the Iraqi navy. There was an urgent need for training the crews to operate these boats. This training would help Iraq take full control of its own security. Under a short and tight timeline, VSD brought a full spectrum of training system engineers, instructional designers, curriculum developers, and subject matter experts to design and deliver a comprehensive training program. The team successfully met aggressive project milestones by providing high-level engineering and expert management practices. VSD accomplished the mission in seven months from the date of contract to the required start of training. Additionally, VSD produced more than 1,590 hours of instructional content and provided instructors and translators for the training. On September 26, 2010, the Iraqi navy commissioned the first Swift-class patrol boat in Umm Qasr, Iraq. The patrol boat crew showcased their deep understanding of their craft by demonstrating the ship’s operation for those attending the ceremony. This signaled that the Iraqi navy’s transition to full control of their maritime security was well under way. We have earned a reputation for being FAST and RELIABLE. 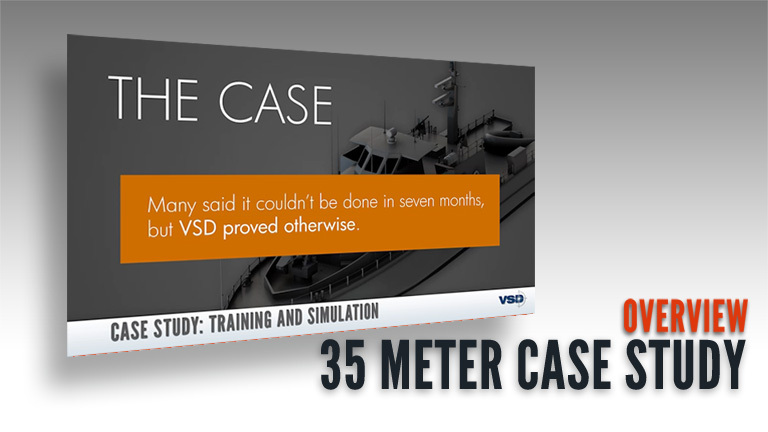 VSD will successfully fulfill your SIMULATION and TRAINING requirements.